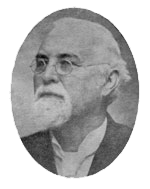 Stephen Pyott was born in Rhea County in 1853. Pyott received a basic education with particular emphasis in law. For many years he worked at various jobs, including that of clerk aboard a Tennessee River steamboat. It was not until he moved to Hamilton County that Pyoft actually began practicing law. The election of 1884 was one of the most exciting the Hamilton County region had witnessed in years. Both Pyott and his Democratic running mate traveled throughout the county making campaign speeches. The black vote was a key issue during the election, and efforts were made by both parties to secure it. The day before the election, rallies were held late into the night. Flowery speeches were given, bonfires raged, and fireworks lit up the skies of downtown Chattanooga. The next morning’s count showed that Pyott had won by only 62 votes. On September 2, 1884, he took the oath, becoming the next sheriff of Hamilton County.